New projects were added to eSolutions family! You might have already got acquainted with the main project of eSolutions called 2spyware. However, this is not the only page that we have in our family. 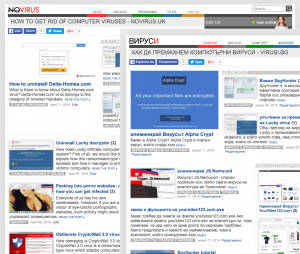 Next to 2 spyware, which is dedicated to viruses, we also manage dieviren.de, lovirus.es and 24 other sites that warn users in different countries about emerging malware each day. However, two websites were added to our clan just several weeks ago. The first of them is called novirus.uk. If you live in the UK, it should become your next best friend. The second one, virusi.bg, is dedicated to Bulgarian PC users and their problems. However, don’t even think that this is the end! We won’t calm down until each of countries has its own virus removal site!